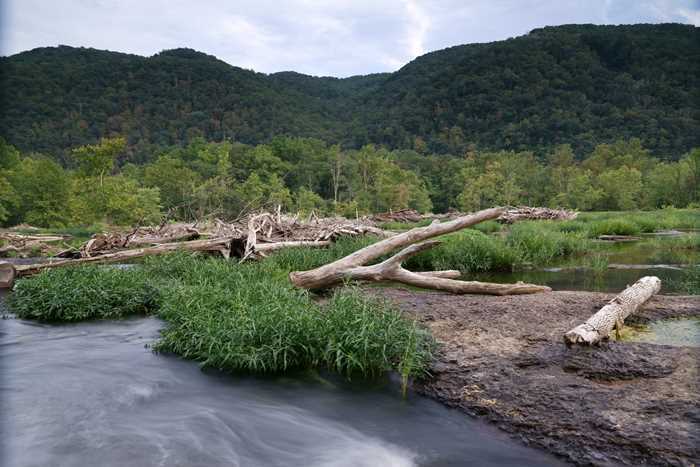 You’ll find one of the prettiest places on the New River just downstream from Hinton, West Virginia. 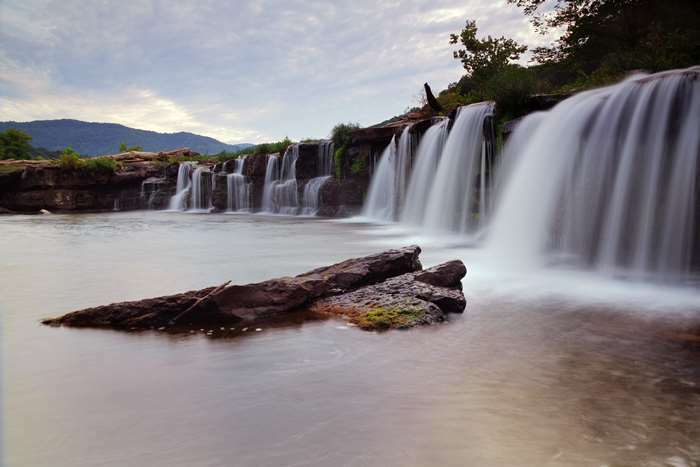 In this area, the river is more than a quarter-mile wide, and it tumbles over a series of cascades (the largest about 25 feet high) known as Sandstone Falls. 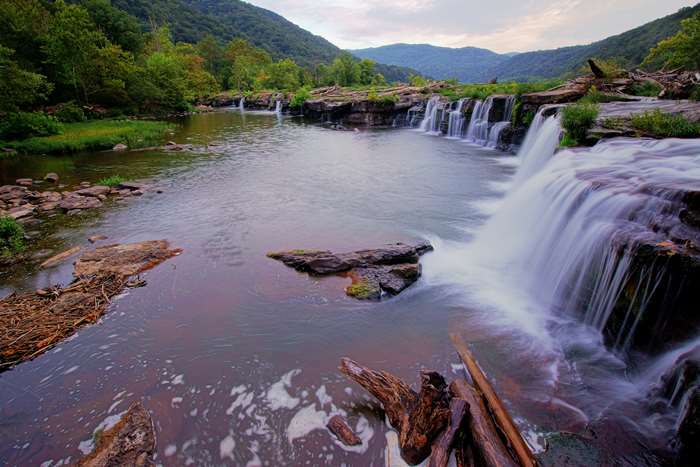 You can view the falls from WV Route 20, just off of Interstate 64, but the best way to appreciate it is to make the time-consuming drive down to the falls for an up-close look. From downtown Hinton, take the Temple Street Bridge (WV-20) across the New River. At the end of the bridge, turn right on County Road 26. Follow this road 8.5 miles to the parking area at Sandstone Falls. 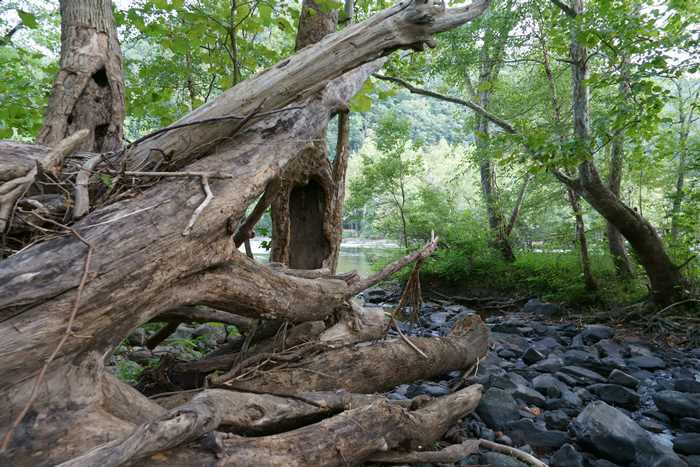 Beyond the parking area, River Road passes underneath Interstate 64 and eventually dead-ends. Unfortunately, there is no access to the interstate on this side of the river. To access I-64, you will need to drive back to Hinton, then follow Temple Street (WV-20) north to I-64 exit 139. You’ve got to admit, that’s pretty darned beautiful. I finished Day 6 of this trip by driving out to Sandstone Falls. But to get this shot, and a few other good ones, I needed to wait until it was almost sunset. And that meant spending almost two hours wandering around. Fortunately, there’s enough here to keep you entertained for a while. 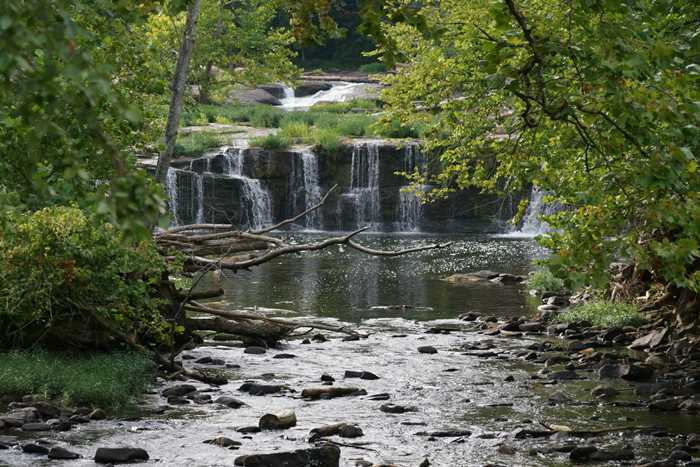 This great view of Sandstone Falls is located just a very short walk from the parking area. 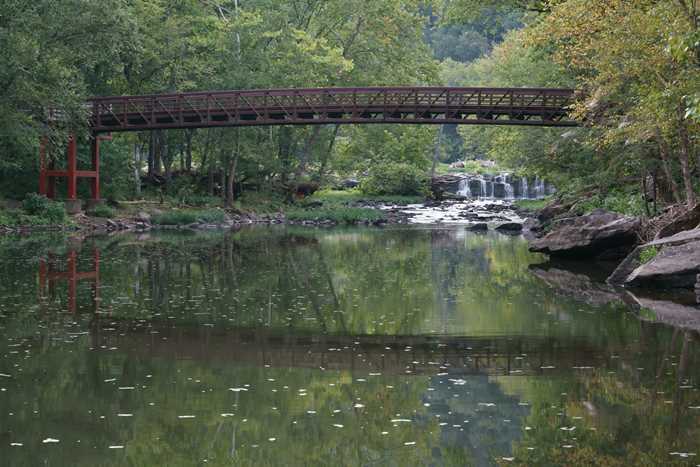 But, there’s also a boardwalk that starts nearby, that takes you out onto an island in the middle of the New River, where a path loops around the island. This path isn’t very long, but I enjoyed it a lot. In fact, since I had to kill some time before sunset, I hiked around this loop twice, and I probably could have done it a couple more times. On this looping path at Sandstone Falls, you’ll pass through a forest of trees dense enough to let you forget you’re actually in the middle of a river. 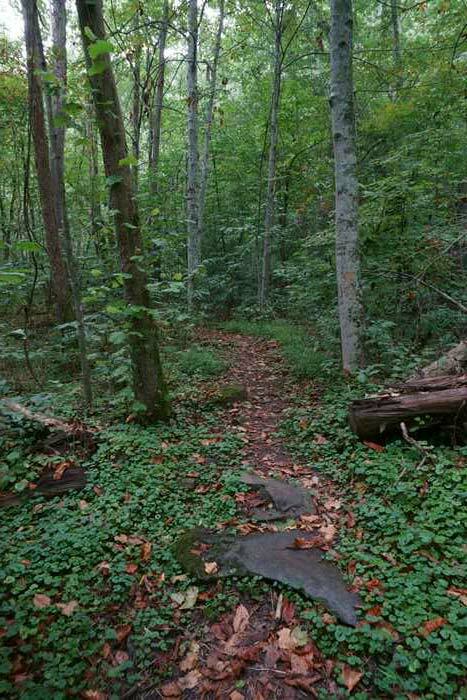 There is an official overlook along this path, as well as some other spots where you can sneak through the ferns and tree trunks and make your way out to the water. … and in one particularly nice spot, the falls are framed by the footbridge that connects to the island. … and discovered that above the falls, the river flows around numerous small islands. With some cautious hopping, you can make your way out onto some of these islands, where some interesting photo opportunities await. Finally, it was time to photograph the falls. I didn’t get the spectacular sunset that I was hoping for — it would have been nice if those clouds had been set ablaze by the setting sun. But, I had some nice, soft light, allowing me to take some long exposures of the falls. I found several good spots for the camera, above and below the falls. A straight-on shot also worked out nicely. However, this is just a small portion of Sandstone Falls. The cascades stretch all the way across the river, which is about 1,500 feet wide in this area, so there are plenty of different ways to take a picture of the falls. The only drawback to visiting Sandstone Falls, and hanging around until sunset, is the long drive back to civilization. The falls are very close to Interstate 64, but unfortunately the road that leads to the falls dead-ends shortly after the parking area. Your only choice is to make the long drive back to Hinton, cross the river, then drive up the other side to get to the interstate. During my visit in 2017, road improvements were underway. Maybe by the time you visit, it will be a much easier drive, but for me, it was exhausting. I drove back to Beckley for my final night in the area. The next day, I’d drive south into Virginia, before making the return to Pittsburgh. 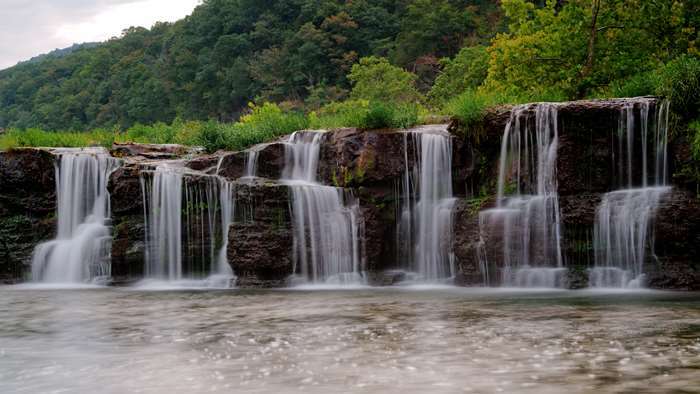 If you like visiting waterfalls, or you’re just looking for a scenic spot to picnic and hike through the woods for a while, it’s worth your time to drive out to Sandstone Falls.